Spring is finally here and it’s the most beautiful season of the year! Skies are blue, flowers are blooming, shoulders are out and it’s officially “get outside and enjoy the sunshine season”! Take the party outside! I love day parties because it means you get more hours out in the sun, and then just sit around and chat way into the sunset, with our draaanks! I love hosting, whether it’s for brunch, cocktails or just spending quality time with my girlfriends. 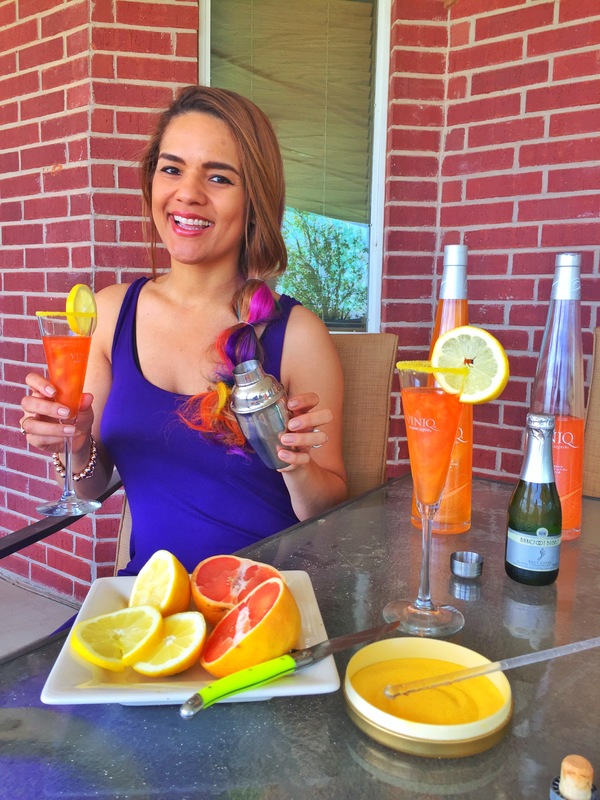 Brunching with the girls is always fun, but mixing your own cocktail with Viniq kicks the traditional brunch cocktail up a notch with the variety of delicious flavors and dazzling shimmer. 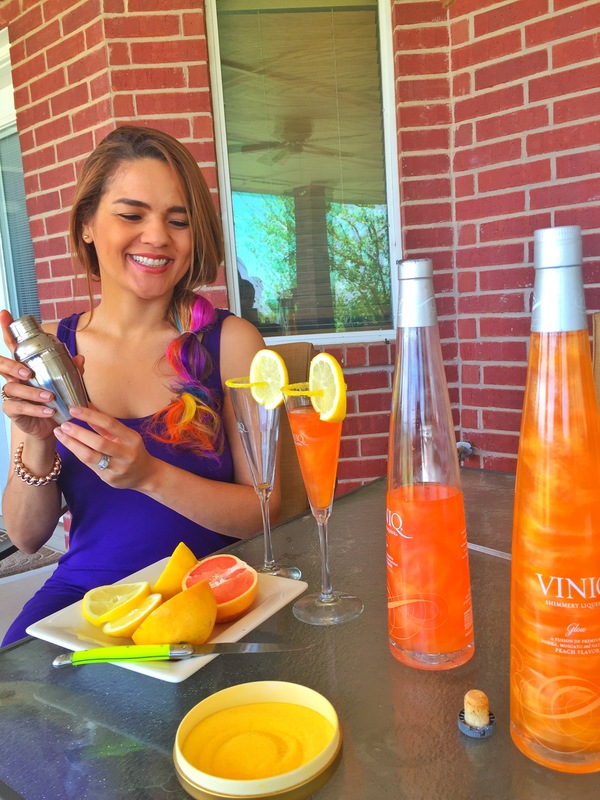 I love sharing my finds with my girls and Viniq is the most FUN drink, especially for an all girl’s thing! It makes snapping pics of your brunch parties that much more beautiful and photogenic. Not to mention, the delicious fusion of premium vodka, moscato and natural fruit flavors of this product make it the perfect addition to a celebratory and fun spring cocktail. Make sure Viniq and the Bubbly are chilled. 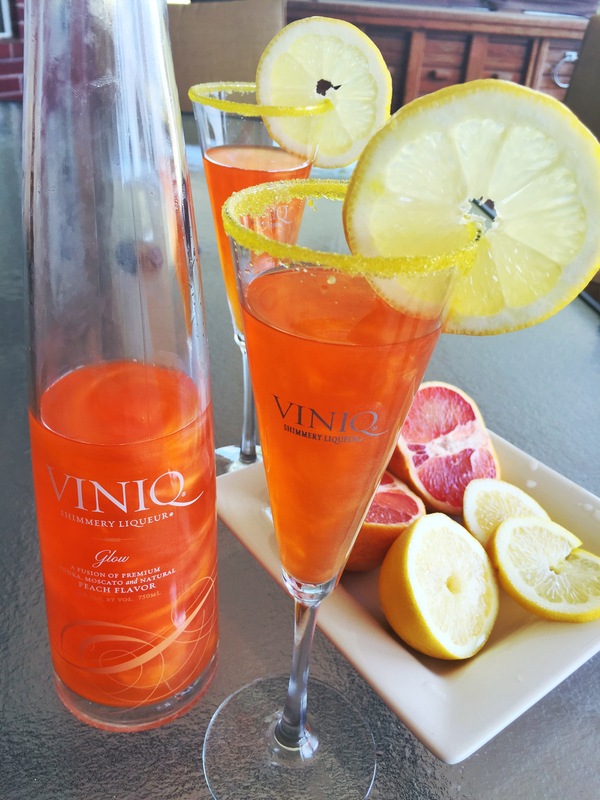 Add Viniq Glow, lemon juice and lastly bubbly to a champagne flute and garnish with a fresh lemon wheel. Swirl gently and enjoy. 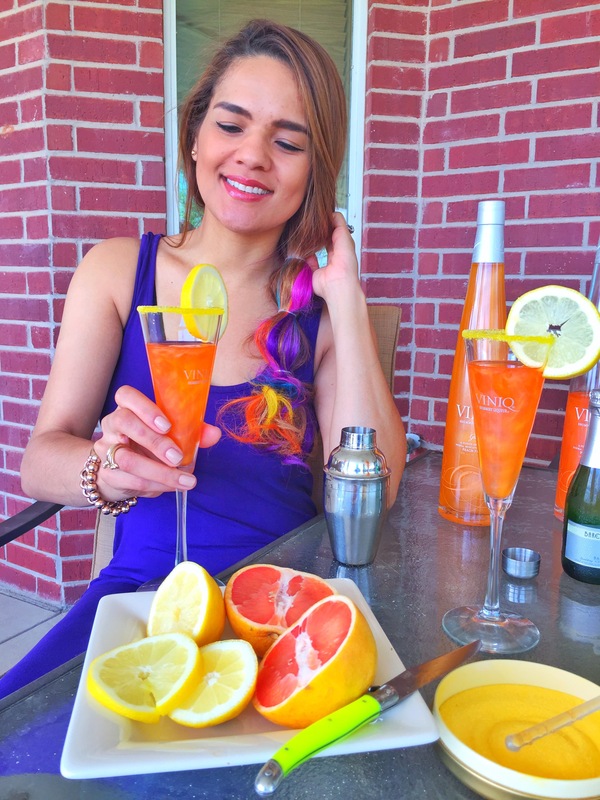 It’s the perfect combination of sweet and tart, not to mention the bubbly ups the drink’s fun factor! The awesome thing about this recipe is that you can swap out the Viniq Glow for any of the Viniq flavors. Perfect weather, perfect set up, ready for the girls to arrive and for the fun to begin! More on that later…. Now we enjoy! Spring, we welcome you! Let’s bring on the shimmer together! Share photos or videos of how you and girlfriends are brunching this spring with the hashtag #bringtheshimmer and see your photos on bringtheshimmer.com alongside mine. This entry was posted in Uncategorized, Wine and Dine, Wines We Enjoy and tagged bring the shimmer, ruby viniq, shimmery drink, viniq, viniq glow, viniq squad. Ah yes, nicely put, evoenrye.